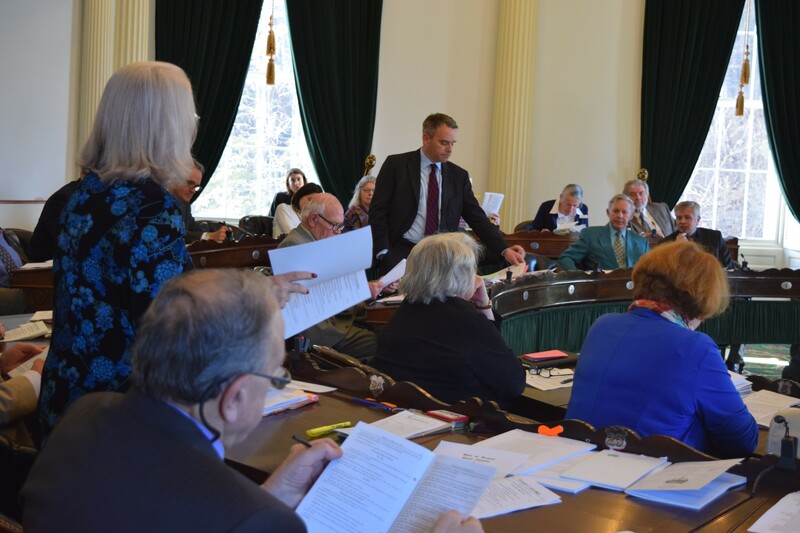 Sen. Peg Flory (R-Rutland) questions Sen. Brian Campion (D-Bennington) on a resolution related to climate change Tuesday. By a 23-5 vote, the Senate voiced its agreement. But what will the resolution do? Everything and nothing seemed to be the answer. “What is the net effect of passing this and the purpose for passing this?” Sen. Peg Flory (R-Rutland) asked Campion during the debate. “I see this as an important step reaffirming the basis for policy. It will also send a really important, clear message to the really young people in Vermont,” Campion responded. 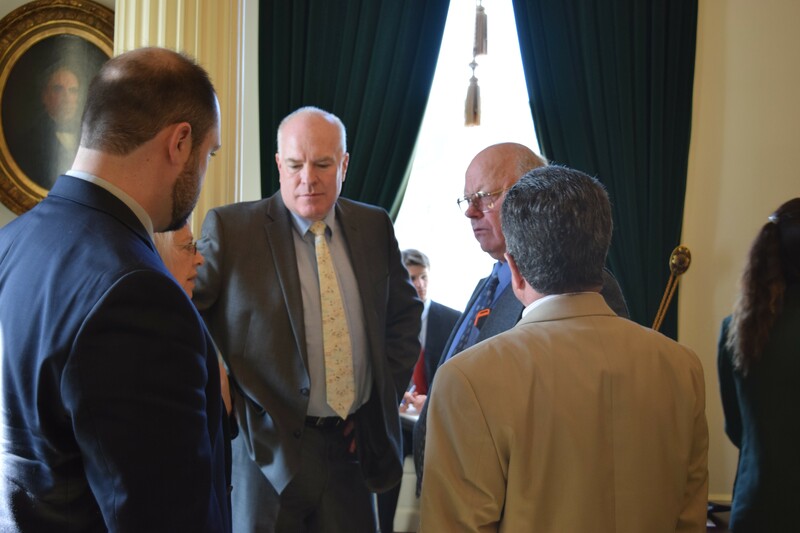 A few minutes later, Sen. John Rodgers (D-Essex/Orleans) questioned whether the resolution would prompt the state Public Service Board to more hastily approve renewable energy projects to combat climate change. Sen. Joe Benning (R-Caledonia), center, strategizes with fellow Republicans on Tuesday as the Senate prepared to debate a climate-change resolution. “I’m not willing to give them another reason, which I believe this is, to rubber stamp bad renewable energy projects,” said Rodgers, who joined four Republicans in opposing the resolution. It wouldn't do that, Campion responded. “I do want to remind us this is a non-binding resolution,” he said. Just as strongly as he argued for the importance of the resolution, he was acknowledging its ineffectiveness. After the vote, Sen. Joe Benning (R-Caledonia) let loose on the whole idea. He voted against the resolution even though he believes the climate is changing and humans are contributing to that. “I disagree with the idea that we should be making a proclamation which in the end has the sole effect of providing fodder for political and advocacy groups,” Benning said. Indeed, it will surely become such fodder. Julia Michel, a lobbyist for the Vermont Public Interest Research Group, said her organization pushed for the resolution as a way to counteract national elected leaders who deny man-made climate change. “The first step in solving the problem is recognizing that you have a problem,” she said. But VPIRG is also likely to use the resolution in its legislative scorecard after the session, she said. Another driving factor behind the resolution, suggested Sen. Dustin Degree (R-Franklin): To counter the message sent last year by Campion's predecessor, Bob Hartwell. The former chairman of the Senate Natural Resources and Energy Committee questioned whether human's contribute to climate change in an interview last year with Seven Days, drawing broad condemnation. Hartwell opted not to seek re-election. Campion now serves on his former committee. "Climate change is not a hoax," Campion said Tuesday on the Senate floor. "It personally concerns me that many policy makers thoughout the United States have publicly questioned the science that humans have contributed significantly to climate change."